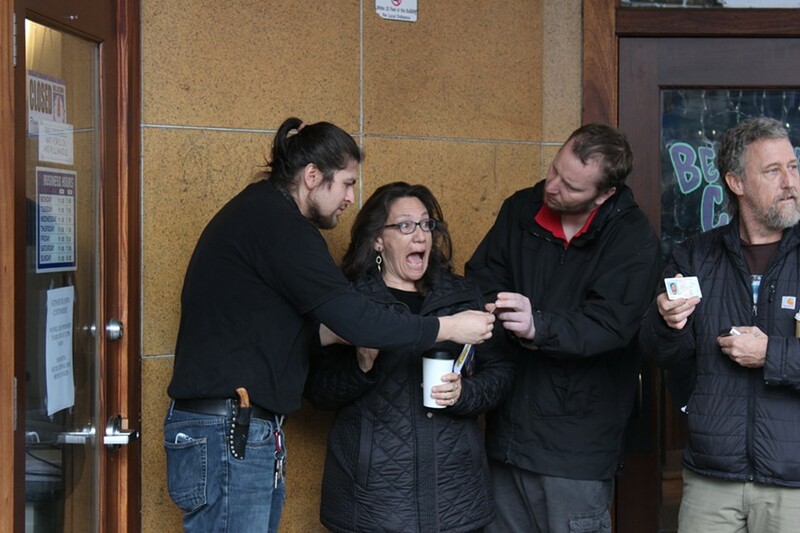 Troy McCornack, working the door at the Eco dispensary in Eureka, checks the ID of Laura Montagna, who got in line two hours before the shop opened to become Humboldt County's first recreational cannabis customer. 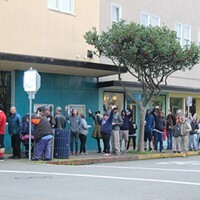 Dozens lined up on Eureka’s F Street this morning, waiting to become the first people in Humboldt County to legally purchase recreational cannabis. 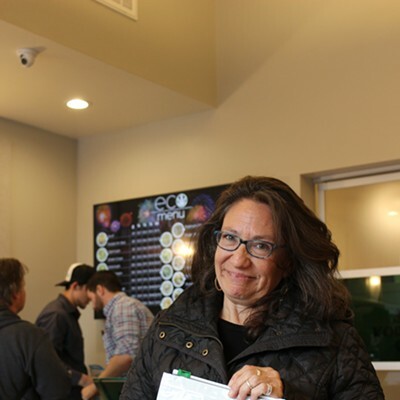 Laura Montagna was the first in line, having shown up at about 10 a.m. — two hours before Eco, the only state licensed dispensary in Humboldt County, was slated to open its doors. What was she planning on buying, a reporter asked. 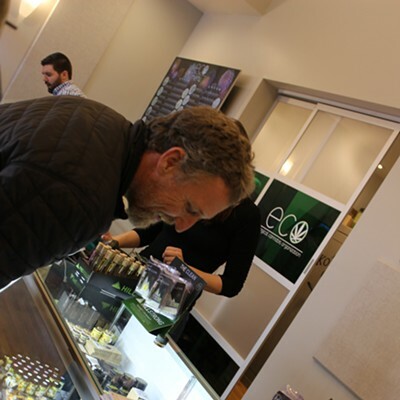 While a number of local dispensaries were rushing to get their paperwork submitted to the state with the hopes of being licensed in time for the opening of the state’s recreational markets today, only Eco got the nod. 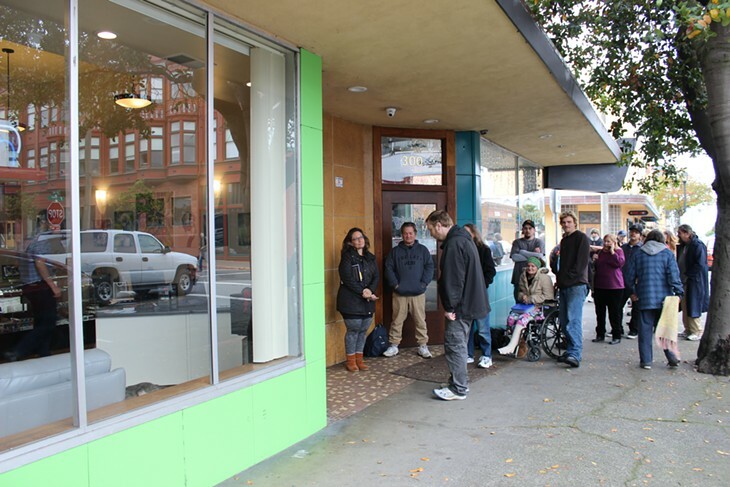 The Humboldt Patient Resource Center in Arcata only got local recreational permits last week and quickly rushed its paperwork to the state, which apparently couldn’t process it in time to make the deadline. 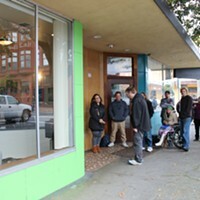 Andrew Jordan, a local contractor, said he showed up at the Arcata center but employees greeted him at the door, telling him they hadn’t received the necessary license and sending him on to Eco. 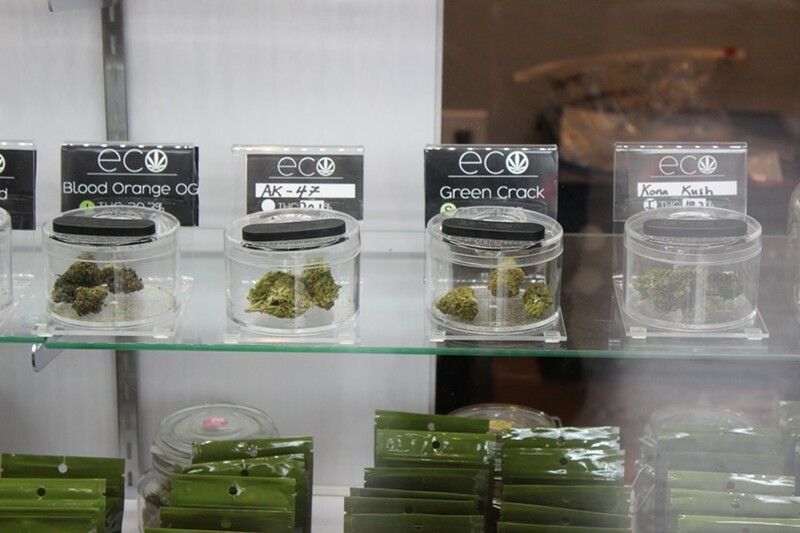 A variety of bud offerings at Eco. 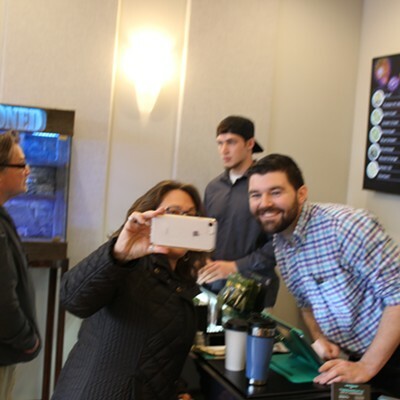 While there is a lot of uncertainty surrounding the state’s new regulatory framework — with everyone from farmers to dispensary owners wondering if they’ll be able to stay competitive and make ends meet — the mood in line this morning was jovial. A man played music from a small speaker — The Beatles, Bob Marley, The Grateful Dead — saying he made the playlist special for the historic day. 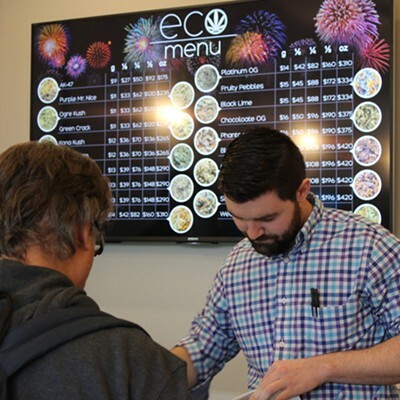 Eco’s doorman, Troy McCornack, opened the doors as soon as the clock struck noon, began checking IDs and letting customers file in 10 at a time. Inside, there was a distinct children-in-a-candy-shop vibe. 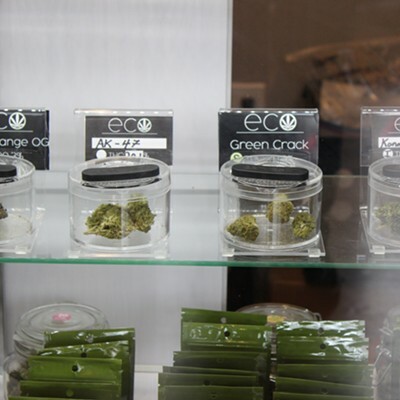 “Are those ganja drinks?” Jordan asked enthusiastically, eyeing brightly colored bottles in a display case. “I need one,” he said resolutely. 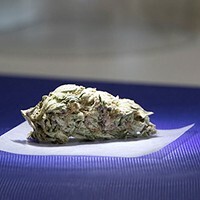 A few minutes earlier, Montagna handed over some cash in exchange for two small bags of cannabis, which Eco manager Ray Markland tucked into one of the opaque ziplock packages required by the state. 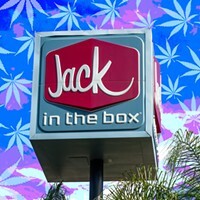 Asked what strain was recommended for helping with those house-cleaning chores, Montagna smirked. 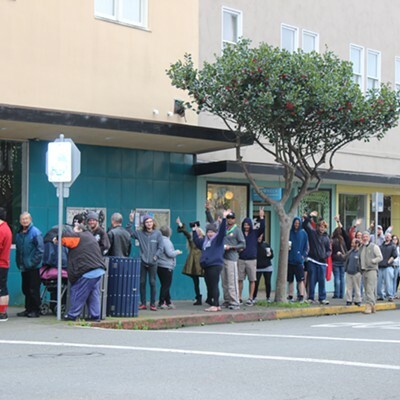 There is plenty of uncertainty about how fully legal weed is going to work in California and what it will mean for Humboldt County, but this afternoon a lot of people just seemed really excited to walk into a storefront to buy some cannabis.